Whilst the water coming from the O'Shannassy watershed was, and still is, vitally important to Melbourne, tin the 1990s the ageing aqueduct was nearing the end of its days. 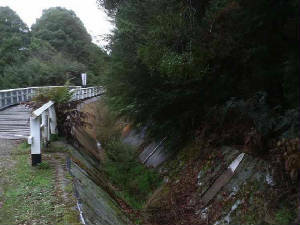 A number of major landslips had caused severe damage to the aqueduct over a period of years (the main ones being at the Dee Road slip and Marysville slip, near Warburton) and whilst they had been repaired, the repairs were now failing. In addition, the cement channel which had for so long stood the test of time was beginning to deteriorate and break up - damage from wild deer, wombats, tree roots, falling trees and water seepage were taking their toll. On an increasing number of occasions, there were major breaches in the channel causing millions of litres of water to come rushing down the moutainside like a tidal wave, carrying everything in its path. Considerable damage to property and homes was caused and whilst, fortunately, no lives were lost, this could easily have been the case. As the risks increased and the cost of repairs escalated, landowners near the aqueduct began to lobby for its closure and with so many alternatives available (piping the entire aqueduct underground was the preferred option) the long term future of the aqueduct was being seriously questioned. In particular, the very costly and labour-intensive nature of the aqueduct's operation, with its extensive "army" of caretakers all performing management of the aqueduct system manually, was in doubt. "Owing to damage which has been done to the aqueduct of the O'shannassy water supply by floods, water from that system will not be available until the end of the week, and then the supply will he only partially restored. 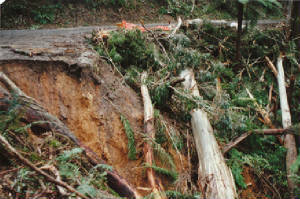 Landslides have broken the aqueduct in many places, and for a distance of 450ft. it has been pushed for ward 2ft. or more. In the meantime water is being drawn from the Yan Yean reservoir. More than 70,000,000 gallons has been used from Yan Yean in the last few days, and the warmer weather of Sunday mid yesterday increased the consumption. Most of the timber mills in the Warburton district were destroyed. This is an extract from the ABC documentary "Black Friday 1939", where people took refuge in the O;Shannassy Aqueduct, above Warburton. "Six hundred men set to work to defend Warburton while the women and holiday makers took to the river as a place of refuge. 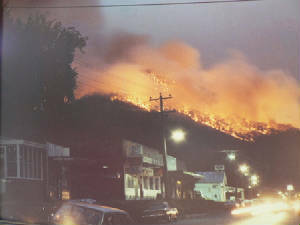 The fire that destroyed the mills in the Acheron Valley on 10 January crossed the Acheron Gap above Warburton between 5.00 and 6.00 pm that evening. At about the same time, the arm of the fire which had burnt-out the Watts Valley above Healesville crossed the flanks of Mt Donna Buang. The two fires met up again at about 4.00 am on the following morning and began to burn down the valley of Cement Creek, tending eastward towards the O'Shannassy catchment. As the wind dropped, the fire began to slow. Thursday was a day of little wind and the immediate danger to the townships of Warburton and East Warburton began to ease. Between them, Police Constable Albert Theobald and Forest Officer George Burns had less than ten men to protect two miles of township at East Warburton. On Friday morning the wind rose again. Des Morrish, Max Sparkes and Harry Martyr had stationed their fire engine adjacent to the O'Shannassy aqueduct above the Warburton Golf Course and were swimming in the channel to stay cool. When the wind rose they heard a roar like a tornado. The fire leapt from the flanks of Donna Buang and ran like lightning downhill along Parburys Creek through wet scrub considered impossible to burn under normal conditions. It crossed the Yarra River without pause and, moments later, Mount Little Joe was aflame and Warburton was ringed with fire. On March 7, 1926, bush fires swept a large area near O'Shannassy waterworks. A dense forest on both sides of O'Shannassy aqueduct was burnt out for four and a half miles. The fire continued along the upper' side of the aqueduct to within half a mile of the weir, where 200 men are camped. They checked it out and made several breaks, which it was stated had stopped ' the. sweep, of 'the fires, though much depends on the wind.'. A caretaker's hut near Little Cement Creek was destroyed, and a dozen men engaged in repair work lost everything. 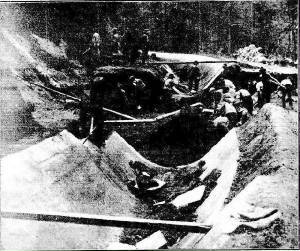 Seven trees have fallen across the aqueduct' through which a great quantity of Melbourne's water supply comes, and in.five sections the lining of the aqueduct has been broken. One tree, which fell into the aqueduct, would probably have blocked the flow of water, but a little water is flowing."